WASHINGTON — Volkswagen has disclosed to U.S. regulators that there is additional suspect software in its 2016 diesel models that would potentially help their exhaust systems run cleaner during government tests. Volkswagen confirmed to The Associated Press that the “auxiliary emissions control device” at issue operates differently from the “defeat” device software included in the company’s 2009 to 2015 models disclosed last month. That disclosure triggered the worldwide cheating scandal engulfing the world’s largest automaker. The newly revealed software makes a pollution control catalyst heat up faster, improving performance of the device that separates smog-causing nitrogen oxide into harmless nitrogen and oxygen gases. VW spokeswoman Jeannine Ginivan said the new issue with the 2016 diesel models, known as an auxiliary emissions control device, was first revealed last week to U.S. Environmental Protection Agency and California regulators. Automakers routinely place auxiliary emissions control devices on cars, though they are required by law to disclose them as part of the process to receive clean emissions certifications required to sell cars in the country. Regulators have not yet determined whether the code is a defeat device installed specifically to cheat on emissions tests. AP first reported Oct. 7 that the EPA and California Air Resources Board are investigating “the nature and purpose” of additional software on the new VW models. Regulators have not yet determined whether the code is a defeat device installed specifically to cheat on emissions tests, said Janet McCabe, acting assistant EPA administrator for air quality. McCabe wouldn’t say if VW’s failure to disclose the software in its 2016 application for emissions certification was illegal. “I don’t want to speak to any potential subjects of an enforcement activity,” she said. The delay is bad news for Volkswagen dealers, who had been anticipating delivery of the new models to replace older inventory which they can no longer offer to customers. Thousands of 2016 Beetles, Golfs, Jettas and Passats will remain quarantined in U.S. ports until a fix can be developed, approved and carried out. Volkswagen already faced an ongoing criminal investigation and billions in fines for violating the Clean Air Act for its earlier emissions cheat, as well as a raft of state investigations and class-action lawsuits filed on behalf of customers. 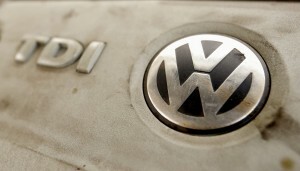 If it is determined the new issue is a second defeat device, that would call into question recent assertions by top VW executives that responsibility for the cheating scheme lay with a handful of rogue software developers who wrote the original code installed with the company’s diesel engines starting with the 2009 model year. The separate device included in the redesigned 2016 cars would appear to suggest a multi-year effort by the company to influence U.S. emissions tests that continued even after regulators began pressing the company last year about irregularities with the emissions produced by the older cars. A congressional staffer briefed on the issue last week told AP that VW probably didn’t need the additional software to meet government emissions standards, but that the device appears intended to ensure the 2016 cars would pass by wider margins. The staffer spoke on the condition of anonymity because he was not authorized to talk publicly about the ongoing investigation. The company’s most senior U.S.-based executive announced in congressional testimony last week that the German automaker had withdrawn applications seeking certification of its 2016 diesels because of on-board software that hadn’t been disclosed to regulators. However, the statement by Volkswagen of America CEO Michael Horn left unclear whether the issue with the 2016 models was the same as that in the earlier models, or whether it potentially constituted a new violation. VW is now working with regulators to continue the certification process needed to sell the 2016 diesel cars. Matthew Daly contributed from Washington. Krisher reported from Ann Arbor, Michigan.